Do you have extra venison in the freezer you’ve been meaning to use? Archery season opens statewide this weekend, Sept. 29, so if you’re looking to cook the meat before this year’s deer season, this recipe might be perfect for you! On Wild Game Wednesday, we take a moment to recognize one of the most important reasons people take to the woods and fields to hunt: to fill their freezers with types of fresh, organic meat. 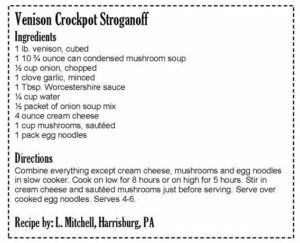 These weekly posts include delicious, easy and in-season wild game recipes from the Pennsylvania Game Commission’s Game Cookbook that you and your family can prepare. Let us know if you try this recipe. Enjoy! If you are interested in more wild game recipes submitted by people from around Pennsylvania, visit www.theoutdoorshop.state.pa.us//FBG/game/GameProductSelect.asp?catid=BKS to purchase the second edition of the cookbook for less than $10!